The Rhythm 29er by Muse Cycles is designed for getting your grove on in tight twisty single track. Short wheel base make for a lively energetic ride. 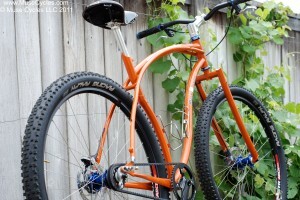 Single speed with Gates Carbon Drive or chain, 1×10 with a rear derailleur, or 8-14 speed with a internal geared hub. The Rhythm 29er frame is constructed from a custom blend of double butted, single butted and aircraft grade 4130 steel to help achieve the classic steel ride. The frame is joined using a combination of TIG welding and silver and bronze brazing techniques. The seat tube is created from a curved section of tube and a straight section of tube and joined with a lug to ensure ideal tire clearance, strength, and further creates a matching concentric radius curve to the rear tire. Go ahead – find your Rhythm on your favorite Single track on a Muse Cycles Rhythm 29er.